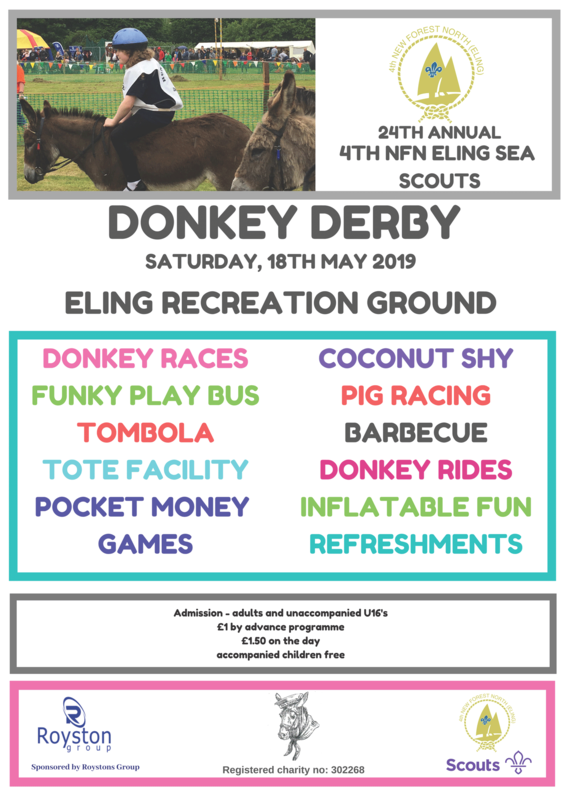 Yes, believe it or not, Eling Sea Scouts’ Donkey Derby will soon be here. Please make a note in your diary for 1pm Saturday 18th May- a family fun day not to be missed, now in its 24th year. This is the main fundraising event for the group, and helps us provide skills for life, challenge and adventure for over 120 local youngsters, as well as maintaining our Aquativity Centre at Testwood Lakes, which is shared with Sailability, who train disabled people to get out on the water. Entry is £1.50 on the day, but buy a programme from local sellers before the event and you will only have to pay £1. To add to your fun for the day, why not sponsor a donkey for as little as £10? You will be able to name the donkey, you will be credited in the programme and could win the prestigious owner’s trophy. You can also nominate a child between 9 and 14 years and under 50 kilos to ride your donkey. Please complete the sponsorship form and return it to chair@elingseascouts.org.uk as soon as possible to secure your sponsorship. It takes a lot of effort to put on this event each year and we’d like to thank the team of parents and supporters who ensure that Totton gets to enjoy the day each year. We are now looking for people to join our fundraisers, including a chairperson to lead the team. Full details of what is involved can be found here.